Mysterious and aloof, he captures Luce Price’s attention from the moment she sees him on her first day at the Sword & Cross boarding school in sultry Savannah. He’s the one bright spot in a place where cell phones are forbidden, the other students are all screw ups, and security cameras watch every move. Even Daniel wants nothing to do with Luce, he goes out of his way to make that very clear. But she can’t let it go. Drawn to him like a moth to a flame, Luce has to find out what Daniel is so desperate to keep secret... Even if it kills her. Lucinda Price sees shadows, wisps of black smoke that have ruined her life. Luce has been uprooted from her elaborate private school education, and sent to the Sword & Cross reform school. The Sword & Cross is reminiscent of a maximum security prison, with the suggestion that Luce is in fact dangerous, and needs to be controlled. Luce isn't a criminal, but finds herself in a precarious position due to the suspicious death of Trevor all those months ago. With first day nerves in abundance, Lucy finds herself with the slightly crazy, but entertaining Arriane as a personal guide. The school, a former Military academy during the civil war era, hosts only eighty teens, including Daniel Grigori. Luce feels a familiarity with Daniel, if they had almost met before both landing at the Sword & Cross. Daniel is arrogant, oozes charisma and confidence and doesn't seem interested in Luce's unexplained instant infatuation. But new student Cam is. Cam is the polar opposite to Daniel, smooth, sweet, charming and he has his sights set on Luce. The intense battle for Luce's heart causes both Daniel and Cam to abandon all reasoning, and it quickly escalates into a physical altercation. Both boys are playing for keeps. When Luce discovers the Grigory ancestry, historians that specialise in fallen angel folklore, the dreams of a feathered angelic Daniel, take on an eerie meaning far greater than she realised. But Cam won't give Luce up, he wants her and Luce be damned if Cam can't have her... Literally. 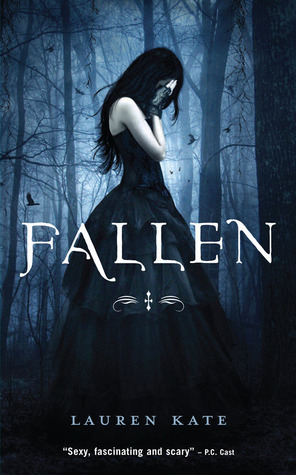 Fallen brings out passionate discussions between readers, invoking emotions you perhaps never knew existed... And that isn't due to the book itself. Most readers who have discovered the Fallen series either seem to be delighted or repulsed, and I can safely say that I'm neither. It didn't invoke any emotion apart from a feeling of boredom. To put it in perspective, I would rate it slightly more favorable than Hush Hush, but even Twilight was far more entertaining. The storyline was not only predictable, it dragged. Against my better judgement, I kept reading, wondering if perhaps there could have been a plot twist on the horizon. Sadly, no. The so called 'reveal' seemed to be what was already blatantly obvious within the first few chapters, and by then, I had no interest in any of the characters or the bizarre love triangle of good and evil. If Luce had a backbone, a personality other than being a boy hungry doormat and stopped flinging herself at anyone who happened to make her feel special, it could have been far easier to read and tolerate. Whinging pyromaniacs who can list their hobbies as stalking, invading others privacy, able to watch fellow students die and feel it's unnecessary to intervene, and still find the time to be the poster girl for a junior Stepford Wife, have no place on my bookshelf. I was looking for your review on this! Does everyone have a friend that abuses their power as office clerk!? Third time I've noticed that. I had to laugh at the two guys getting in a fight over Luce. Just because I know a majority of girls would love for two guys fighting over them but I would dump them both in a second. You look like idiots doing that. It's not attractive. It would make me feel like an object to acquire not an actual person you care for. I don't know. It's just stupid. And I had a feeling that Luce was not going to be worth fighting for. They usually aren't. I wonder who's the evil one? Ohh, it was just terrible! Luce has to be one of most irritating young adult characters I've come across. You can understand that not all female protagonists need to be fighters with big personalities, strong willed and feisty, but she's a complete moron.